And we know that the whole creation groans and travails in pain together until now .... awaiting adoption, the redemption of our body - Rom 8:22-23. I have been invited to speak at the Bawtry Conference (Yorkshire, UK – June 3-5, 2011) on the topic I Go to Prepare a Place for You. I was told, “We’ve suggested you and the topic because you are farther down the track than we are,” which is true, in terms of age, but we never know when our time is up! Thus says the LORD, Let not the wise [man] glory in his wisdom, neither let the mighty [man] glory in his might, let not the rich [man] glory in his riches: But let him that glories glory in this, that he understands and knows me, that I [am] the LORD who exercises loving-kindness, judgment, and righteousness, in the earth: for in these [things] I delight, says the LORD -Jeremiah 9:23-24. Bert Teunis, a dear friend and member of the CWM- Fellowship Management Team, was only 58 when, on Thursday September 9, 2010, he sustained a massive heart attack and was immediately transported from the gym, where he was training, into the presence of Christ, which is “far better” for Bert but extremely traumatic for his family and many friends. 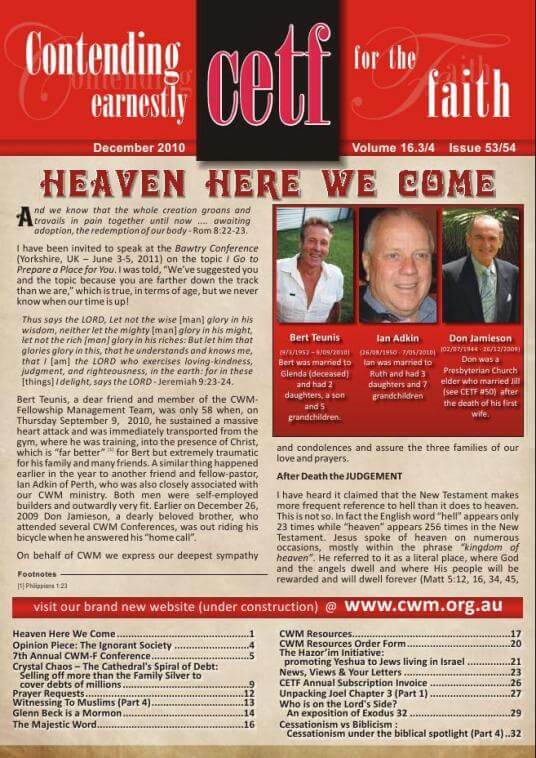 A similar thing happened earlier in the year to another friend and fellow-pastor, Ian Adkin of Perth, who was also closely associated with our CWM ministry. Both men were self-employed builders and outwardly very fit. 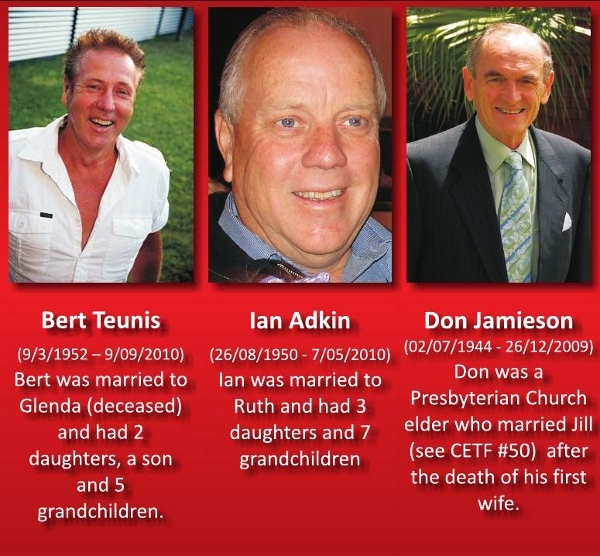 Earlier on December 26, 2009 Don Jamieson, a dearly beloved brother, who attended several CWM Conferences, was out riding his bicycle when he answered his “home call”. On behalf of CWM we express our deepest sympathy and condolences and assure the three families of our love and prayers.After Death the JUDGEMENTI have heard it claimed that the New Testament makes more frequent reference to hell than it does to heaven. This is not so. In fact the English word “hell” appears only 23 times while “heaven” appears 256 times in the New Testament. Jesus spoke of heaven on numerous occasions, mostly within the phrase “kingdom of heaven”. He referred to it as a literal place, where God and the angels dwell and where His people will be rewarded and will dwell forever (Matt 5:12, 16, 34, 45, 48; 6:1, 9; 18:10; Mark 13:25 etc). I go to prepare a place for you. And if I go and prepare a place for you, I will come again and receive you to Myself, so that where I am, you may be also – John 14:2-3. Behold I come quickly (Rev. 3:11; 22:7) ... and my reward is with me to give to each according as his work is (Rev. 22:12) ...yes come Lord Jesus (Rev. 22:20).I don’t know about you but it’s quite apparent to me that we are getting close to the end of the age and to the return of Christ. In the non-Christian world there is restlessness that expresses itself in anxiety, fear and, at times, crazy action. Apart from a personal relationship with God and Christ, most people today don’t know what to do or where to turn.Take as an example the perceived over-population problem of our planet. I say “perceived” because I don’t think population is the real problem. It has more to do with human greed and selfishness. We have an abundant resource and potential to produce much more than is required to sustain a far greater population than we have. But the perception is there and that perception is driving mankind to do and say incredibly evil and mad things. Men's hearts failing them for fear, and the expectation of those things which are coming on the earth - Luke 21:26. And not only so, but ourselves also, who have the first fruit of the Spirit, even we ourselves groan within ourselves, awaiting adoption, the redemption of our body - Romans 8:23. We live in a “groaning creation” and all true Christians groan with it. But, unlike the world without Christ, it is not the groan of despair but of hope and anticipation. This is one of the great indicators that we belong to Christ and that our faith is a true faith. It is grounded not in what we can do but in what Christ has done and will do in, by and through His return, the rapture of His Church and His second coming to this earth: “Even so, COME Lord Jesus.”For this reason, if for no other, the ideas of the Kingdom Now preachers and believers can be dismissed as false. Their hope is the bettering of society, the saving of the world, and the Christianizing of mankind. They seek an ever elusive utopia. Most of the Church Growth advocates fit into this category: Bill Hybels and Nicky Gumbel with their soft sell and non-confrontational “gospel”; Rick Warren and Robert Schuller with their winsome purposes and programmes; Brian Houston and Joel Osteen with their self-indulgent and biblically confused rants. They are not“looking for Christ” in any biblical sense. The reward that all these false teachers offer has nothing at all to do with heaven and the hereafter. It is all to do with the here and now and they themselves are the major benefactors of the pursuit of their mammon.There is no earthly benefit in “selling” heaven. That’s why the “Houstons”, “Osteens” and “Schullers” of this world don’t try. Do any of you dare, when you have a matter against another, to go to law before the unjust, and not before the saints? Do you not know that the saints shall judge the world? And if the world shall be judged by you, are you unworthy to judge the smallest matters? Do you not know that we shall judge angels, not to mention the things of this life? – 1 Corinthians 6:1-3. I take my stand on the Word of God and my freedom of speech rights in a free society and invite your prayers and support. God willing CWM will be conducting our second Conference in Bangladesh in February 2011. This is by invitation as was the first Conference (February 2010). Due to concerns about Kathleen’s and my health we have decided not to go. Our previous visit included India. On that occasion David Mohan, pastor of the 40,000 Church in Chennai thanked and commended me for our stand for TRUTH stating, “We know that it has cost you dearly and we admire you for it.” He also said to me, “Brother Powell what is it that is wrong with Rick Warren? I don’t want to make a mistake.”We apologise for the lateness of CETF #53/54, which includes the annual Voluntary Invoice for your prayerful consideration , see pages 15 & 26. We trust you enjoy and are challenged by the articles in this issue.